I’ve never done a remodel before. Like ever. 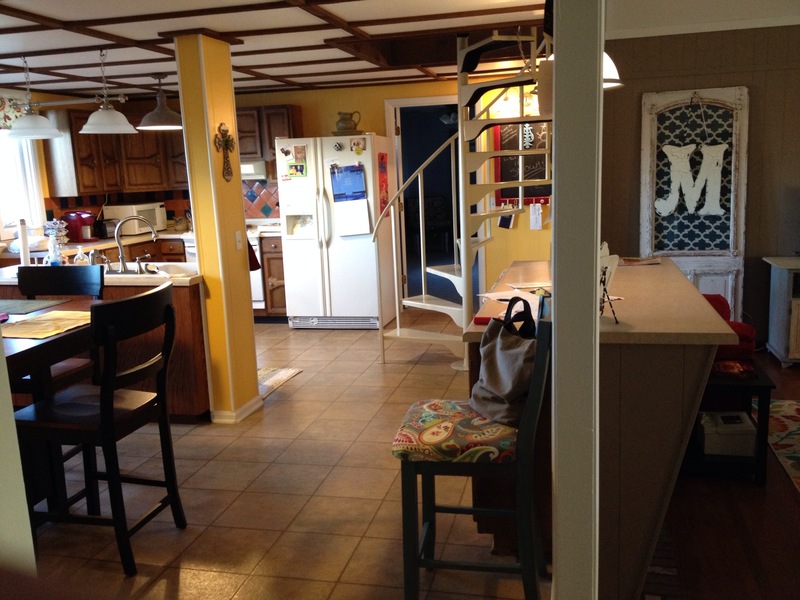 When we took on a kitchen remodel, I had no idea what to expect. I mean, did you guys know that you can’t gut a kitchen and rebuild it in like two weeks when you only work on it at night after work during the biggest snow fall you’ve ever seen in your area in ten years? Well neither did I. I mean, WHAT’S THE BIG DEAL?! Why does this stuff take so long? It’s been quite the learning experience. And quite the adventure. Do you want to know all the dirty details? Well, here’s a couple just for kicks and giggles…we found at least three whole mouse skeletons behind the paneling, vacuumed up my weight in mouse droppings after we took down the ceiling tiles, and found out that the wiring to our oven probably could have burned the house down any second. And that’s just the tip of the iceberg of all the fun stories and details I could tell you about the remodel. But that does also explain why we now have six cats…. Long story short, when we bought our home about 8 months ago, our kitchen looked like this. Yellow (nacho cheese to be exact) walls, Spanish style backsplash, 7 foot (SEVEN!!) 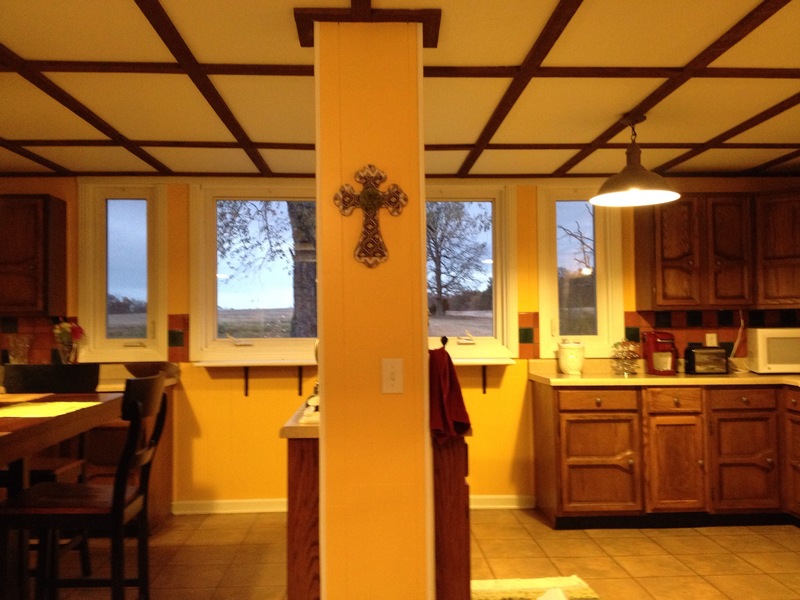 ceilings, dark and dated cabinets. THAT COLUMN. But seriously…..let’s go back to the NACHO CHEESE WALLS AND SPANISH TILE…whaaaaaaa?? Oh and Dad kept hitting his head on the light fixtures when he came over…because you know….7 FOOT CEILINGS. Not to mention the layout was SO WEIRD. The room was so big, but the layout made it feel so small and cramped. And those metal stairs to the never used attic took up half the kitchen! So we began in March with the demolition and ended the majority of the remodel in April. It was so nice to rip out all these things I didn’t like. Putting things back was another story. We bought new cabinets, and replaced our old appliances. That was the largest part of our budget. We laid our own flooring, and I did all the trim work. Danny, my dad, and his friend did the wiring for the new lights and moved the plumbing for the sink. 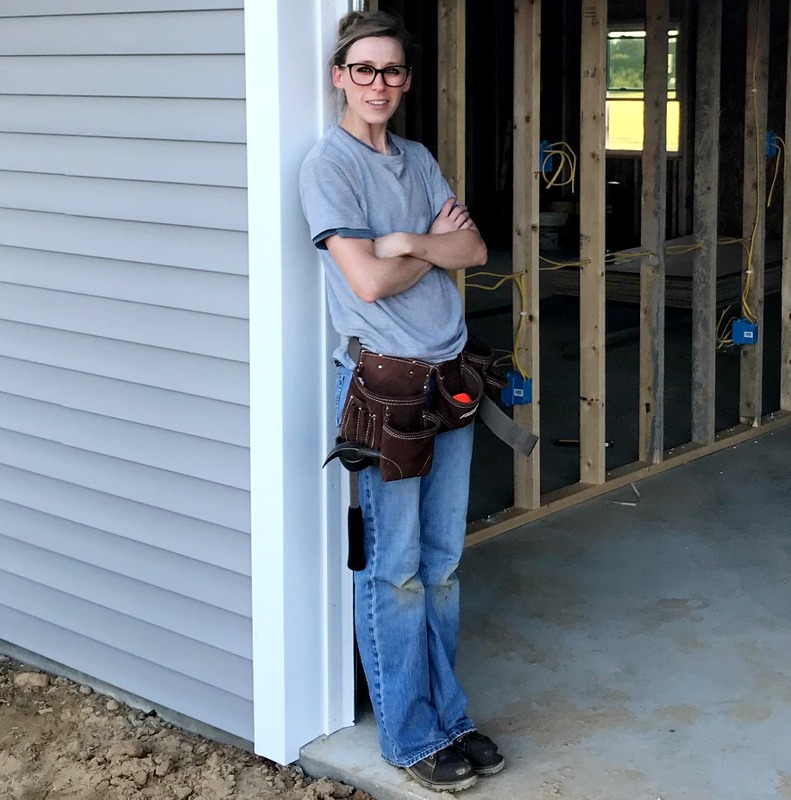 Dad’s friend taught us how to do drywall and that was a nightmare (SO. MUCH. DUST.). I kind of understand why people use paneling now haha….I said KIND OF. So what’s my favorite part? Don’t laugh, but it’s the windows. They were already here before the remodel, but with the trim on them now, it’s like totally different windows! Plus it was my FIRST EVER trim work. And Danny was impressed. And it takes a lot to impress Danny. What’s your favorite part? Keep your eyes peeled…we are staying super busy and have lots to show you soon! Love, love, love everything about this! 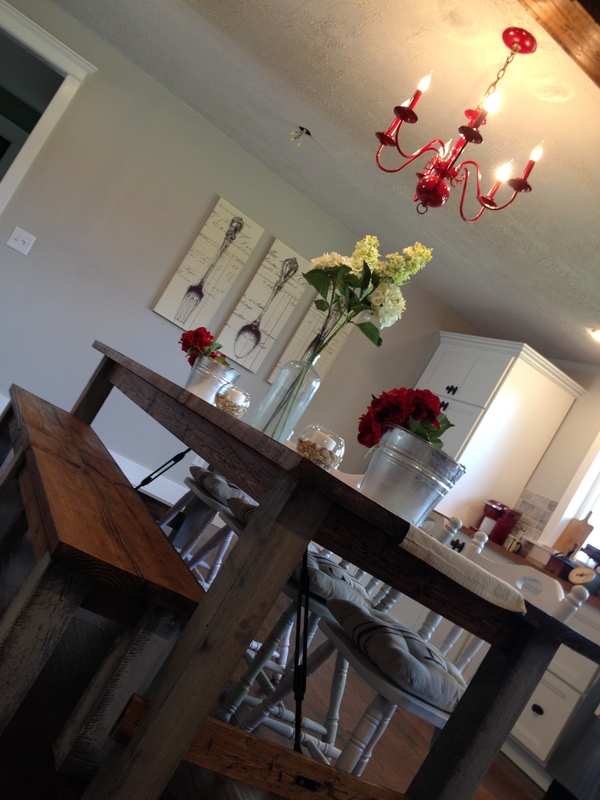 The painted chandelier is so fun, and I adore the table, bench, and chairs. What color of paint did you use on your walls? Thank you! The walls are repose grey sherwin Williams. We painted our kitchen and living room both this color and I love it! Eventually the whole house will probably be that color too haha! What kind of wood did you use on the beam in the middle of the kitchen? Hi Joe! It’s just regular 1×6 spruce/whiteboard. We just built a box around the metal I-beam we used. Wow! Very impressive. You and your husband did a wonderful job. Your kitchen is beautiful! My husband and I just bought our retirement home and at the young age of 60, will be doing a remodel similar to what you guys have done. Fingers crossed, lol. 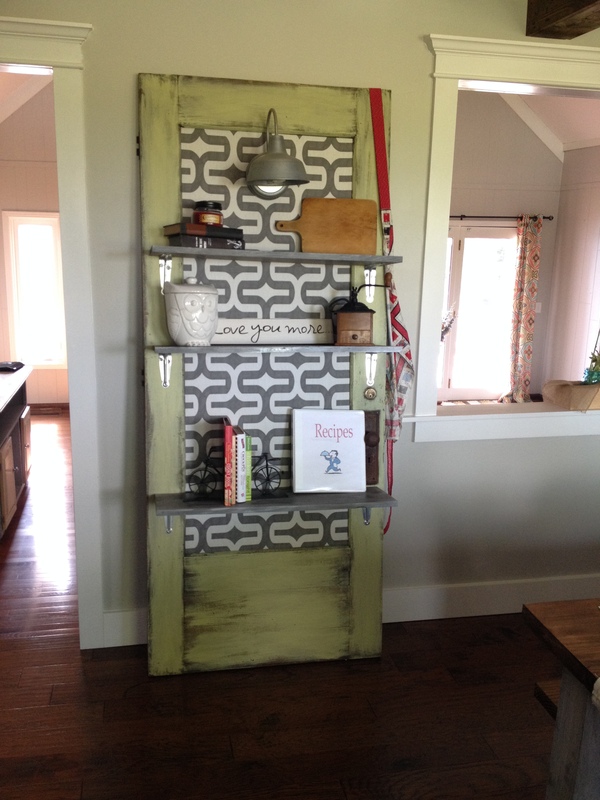 Thanks for sharing your process (btw, those are some mad woodworking skills you got there!). Best Wishes.